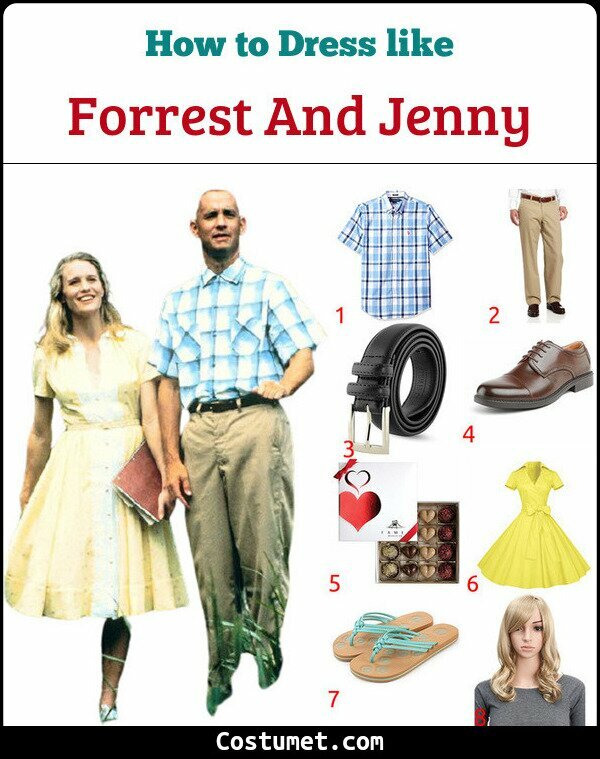 Being young persons in the sixties in the South, both Jenny and Forrest have a style that speaks of that time which are conservative and colorful. Also, their colors of clothes often compliment each other in a number of scene. So we'll choose the outfit from this period of their life. Forrest wears a blue plaid shirt with short sleeves, khaki pants with black belt, and a pair of leather shoes. As for Jenny, she wears a cute yellow summer dress and slippers. Are you and your friend interested in becoming the cutest couple on screen now? checkout our item list down here on how to recreate their style! 1 Light Blue Plaid Shirt Find a light blue plaid shirt with short sleeves to wear. 2 Khaki Pants Pair up your top with a pair of straight fit khaki pants. 3 Black Belt Fasten your pants with a black leather belt. 4 Brown Leather Shoes Match your outfit with brown leather shoes. 5 Chocolate Box 'Life is a box of chocolates', make the statement concrete by having Forrest hold the chocolate box. 6 Yellow Summer Dress For Jenny's look, pick a yellow summer dress with short sleeves. 7 Blue Sandals Pair up the dress with blue slippers. 8 Blond Wig If you don't have blonde hair but want to create Jenny's hairstyle, get yourself a blonde wig with medium length. 9 Red Notebook Carry a red notebook as your prop. Although they're not the most romantic couple on screen, or the couple for that matter, they're on of the cutest ones for sure. Jenny and Forrest are childhood friends. And of course, he has a crush on her, the feeling which continues throughout his life. Though they were never together, they always come back to each other for the rest of their life. In 1994, a feel-good comedy-drama movie "Forrest Gump" was released. It starred Tom Hanks as Forrest Gump. The story revolves around Forrest, a slow-witted but kind-hearted and lucky man from Alabama, as he goes through his life. Though the life is hard, optimism and sunshine in Forrest's pocket only brings about good fortune and incredible story.